Description: This was my first attempt at a Junction Module. I used the planning ideas that were being developed in the US and published on the un-official site, and adapted the measurements to fit the metric measurments we use in Australia. I think it was the first junction module made in Oz. 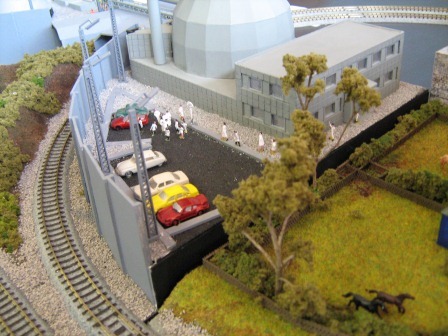 The old nuclear power plant model was adapted and I added some extra pipework and some elevated pathways from one side of the junction to the other. 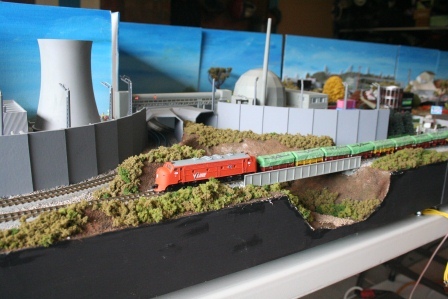 All the tunnel portals and the large security wall were constructed with 2mm card which I painted with cheap grey acrylic paint to simulate concrete retaining walls. Lots of scientists are evacuating to the car park on one side while the maintenance staff are meeting near the cooling tower. I used MDF composite wood to make the module so I used a hobby knife to remove the wood for the cutting at the front of the module. The small gorge contains a hidden overflow pipe from the powerplant. The junction module has been used in a pair to create a three loop exhibition layout over the last few years.